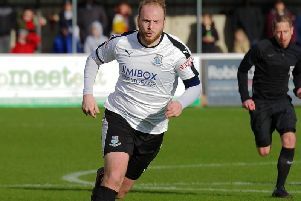 An injury time Alistair Waddecar penalty denied Lancaster City all three points at derby rivals Bamber Bridge. The home side had led at half-time thanks to a Matt Dudley goal but strikes from Brad Carsley and Glenn Steel turned the game on its head in the second half. But with seconds left in the game Brig drew level through Waddecar, who kept his cool to score from the penalty spot. As expected of any derby game, things started scrappy with both sides working hard in the opening minutes. Adam Dodd fired over after a neat Brig move, before Lloyd Rigby raced off his line to smother David Norris’ shot for Lancaster. But with a quarter of an hour gone, it was the hosts who hit the front when Dudley found himself free in the box to tap home Scott Harries’ dangerous low cross. The away side responded well to falling behind and continued to search for an equaliser. On the half hour mark, Paul Dugdale prodded a close-range effort inches wide after the ball broke loose following the corner. Norris then found space on the edge of the box, but a crucial block from Brig’s captain Matt Lawlor saw his powerful strike deflect wide. Despite falling under late pressure, Micky Taylor’s men stood firm and went in at the break ahead. But the visitors came out in the second half in a similar way to how they ended the first, with Rigby called into action early on to parry Paul Dawson’s effort away. Micky Taylor’s side grew into their stride though and Waddecar almost added a second when he struck a low shot into the side netting, after a lovely piece of skill. Brig’s shot stopper then produced his best save of the night on 70-minutes, when he came to save from Charlie Bailey who was through one-on-one. However, five minutes later he couldn’t keep out the ex-Brig man Carsley, who rose at the back post to nod home the equaliser from a matter of yards out. That equaliser opened the game up, but it was the Dolly Blues who capitalised and took the lead with less than 10 to play. Defender Glenn Steel found himself free inside the box and headed his side in front with a well-placed header across goal. The hosts pushed for an equaliser and amongst a tangle of bodies in the box, the referee awarded Brig a 95th minute penalty. Up stepped Waddecar to slot home for his second goal from the spot in successive games and earn Brig a point on a tight and tense local derby night under the lights.